Student activities were showcased during the meeting, including Cyclone Rocketry Club. 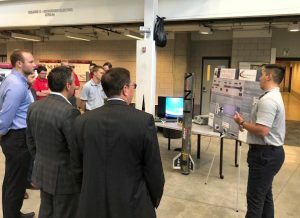 The Department of Aerospace Engineering recently hosted representatives from Boeing and Iowa State University to explore connections between Boeing and aerospace, electrical and computer engineering and mechanical engineering at the university in the areas of space and autonomous systems. 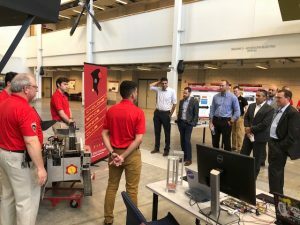 The Cyclone Space Mining Club, which includes students from various College of Engineering departments, is shown with its display at the meeting. The visit – which included meetings, facility tours, an overview of the NASA-sponsored Iowa Space Grant Consortium and examples of student projects – was hosted by the Iowa State University Foundation. The meetings included sessions on student group engagement; an overview of current ISU space-related and autonomy research capabilities; plans for the under-construction Student Innovation Center; immediate and future engagement opportunities and more. 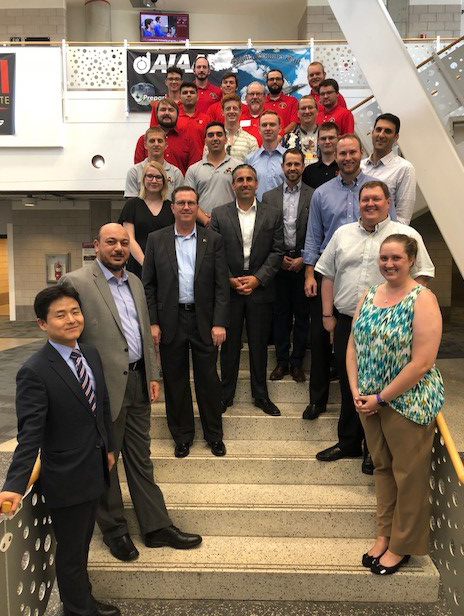 Meeting attendees, including representatives from Boeing and different Iowa State College of Engineering departments, smile for a group shot. Five executives from Boeing joined attendees from Iowa State University which included: James L. and Katherine S. Melsa Dean of Engineering Sarah Rajala; Arun Somani, associate dean for research; Ashfaq Khokhar, chair, Department of Electrical and Computer Engineering; Ryan Harms, executive director of development, Iowa State University Foundation; Alric Rothmayer, interim chair, Department of Aerospace Engineering; Christina Bloebaum, affiliate professor and former interim chair, Department of Aerospace Engineering; Tomas Gonzalez-Torres, director, Iowa Space Grant Consortium; Matt Nelson, Make to Innovate program director; as well as aerospace engineering faculty members Peng Wei, Ossama Abdelkhalik, Bella Kim and Dae Young Lee and Department of Mechanical Engineering faculty member Jim Heise.